Having got the heavy stuff out of the way it was time to start looking at the cosmetics and that leads us to the vexed question of the “clean triangle”. I read on a web site somewhere the words “ an authentic café racer must have a clean triangle”. What???? Well, my first thought was that I can certainly imagine Mitzi doing her bit with a lady shave, but Ogri?? No way, though I can imagine the facial expression. Then I realised that the chap was talking about the whole business of removing the airbox, buying a very expensive gel battery and hiding it under the seat, to leave the centre section of the frame empty. So having cleared up what a clean triangle is, let’s look at the rest of the statement. What the Flamin’Ada is an “Authentic” café racer? Well, to me it means one of two things, either we’re talking about a really nicely prepared Triton, Norvin, Bonneville etc. with a big Ally tank, high level pipes, clip ons, rearsets and a big chrome headlight or, and far more commonly (which to me means more authentic) a 1960’s British bike with clip-ons and rearsets, possibly a bum stop seat, if they were a bit posh and a few extra shiny bits if the owner could afford it. Pride and Clarke ally mudguards (at least at the front) would be de rigueur, as would a reverse cone mega from the same source. 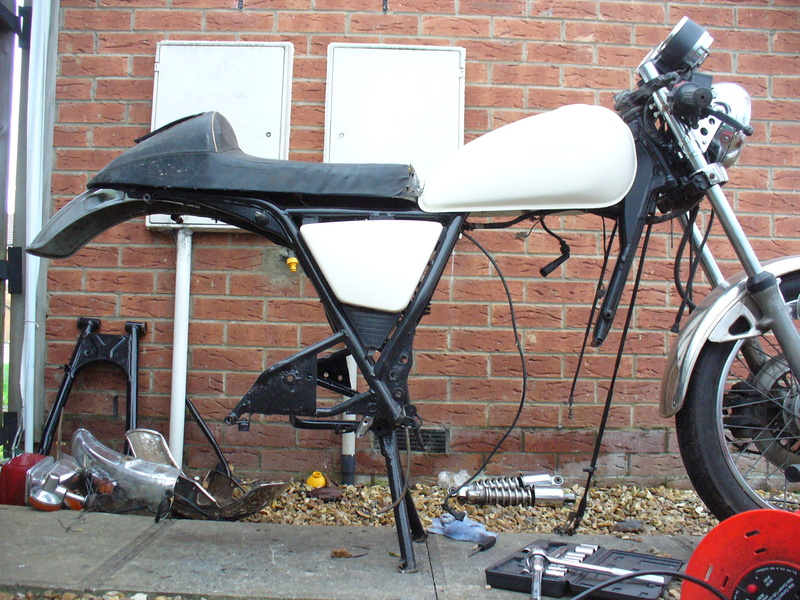 In truth, there never was an “authentic” café racer, it was what we could afford. Now here’s the important point. They were generally Triumphs, BSAs, Nortons or Velocettes, I actually had a 500cc Ariel, but it was a bit of a dog. The crux of the argument being that they were all dry sump engines. That means that when they came out of the factory one side of the “triangle” was the oil tank, the battery usually lived in the middle and the other side was the tool box. Even when converted, at least the oil tank had to go somewhere and in the posher ones it was a rather nice custom aluminium job bang in the middle of said triangle. Most of them just retained the original oil tank and tool/battery box. So even if there was an “authentic” look, it didn’t ever have a clean triangle. The only bikes that came close to a truly clean triangle were genuine circuit racers and I suspect only then the early Japanese ones with wet sumps, though there were a few people putting the oil in the frame. Having said all that, I have to confess here, that I really like that clean look myself and would have no compunction about building a bike that looked that way, but one simply cannot be prescriptive about these things and it can certainly lay no claim to authenticity. Personally I don’t feel the need to aim for an “authentic” look anyway. I’m building a 1995 Suzuki. Just do what works and looks nice to you. So where was I? Oh yes, studying Suzi’s triangle. Now that has a better ring to it. What we have there is a huge airbox with a fairly small, snail shaped inlet, quite a large battery, the regulator/rectifier and a few sundry bits of electrical stuff. To be honest I’m loath to significantly change the inlet arrangement until I start on engine mods. The snail shaped inlet must just be for noise reduction (with a large plenum downstream it can’t possibly be part of a tuned setup) and looks a bit restrictive, so that could come off without more than perhaps a change of main jet, leaving the original filter (well, a new one) in place. The reg/rec is actually in a pretty sensible place and I can’t afford a fancy battery just now, so the original side panels will be retained. The tank is the wrong shape completely, but I’ve seen a couple of bikes where people have lifted the back end of it up a bit and it makes a huge difference. It does mean that some fuel will become inaccessible, which jars painfully against my general rule of function (preferably enhanced) always taking precedence over aesthetics, but I’ll have to swallow it and promise myself that the tank will be replaced later. 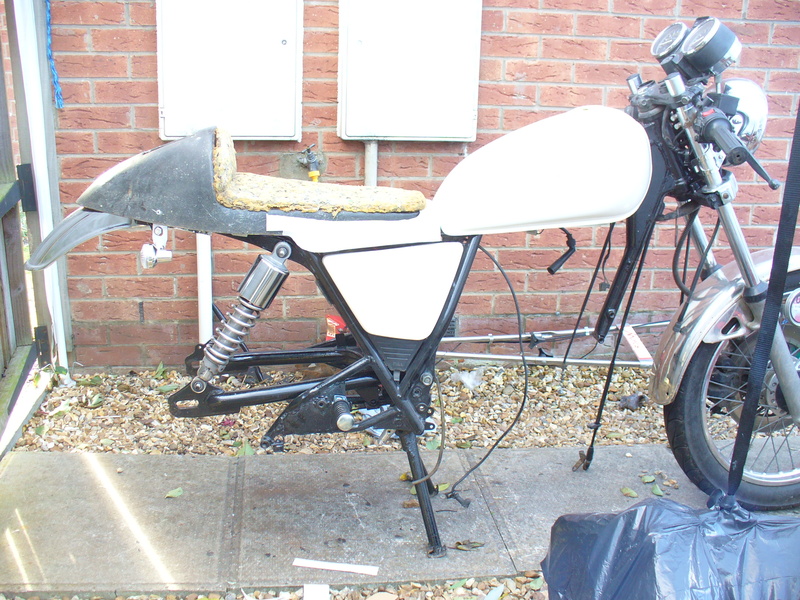 So getting the tank and seat to fit looks like the next move. The tank is rubber mounted, so the simplest way to raise that is to use old technology, by which I mean a lump of wood under the rubber mount and longer bolts. There may be many people who regard using a bit of wood as a frightful bodge, but it has its place. As an engineering material, wood has two big drawbacks. One is that it only works in certain planes (i.e. it has precious little shear strength across the grain) and the other is that it isn’t dimensionally stable, meaning that it will expand when damp and contract when dry. The flip side of this is that it has tremendous resilience in compression (I also build guitars and the tension on a set of steel strings is huge) it’s very easy to work, it’s light and it’s cheap. In short, if all you’re doing is jacking up the back of something non-critical, it works. The seat presented three problems. It was too short to fit nicely at the back, it lacked the right mounting points and it left an awkward shaped gap above the side panels. The rear mounts were a simple matter of riveting and glassing in a couple of brackets, which I left over length to provide mounts for the rear indicators as well. The front and sides were done by fabricating an aluminium “nose” which pop riveted into place, providing a front mounting plate (which would share the tank mounting bolts) and skirts to fill in the gap over the side panels. I’d describe the result as less than perfect, but once more it would suffice until I found/made a new fuel tank. Time was very much of the essence.